But unfortunately we don’t believe that to be the case. We have here John Elliott, an independent transport consultant with over 40 years’ experience in all aspects of transport planning. John has worked at the GLC, and is an expert in traffic management and the impact of building new roads. 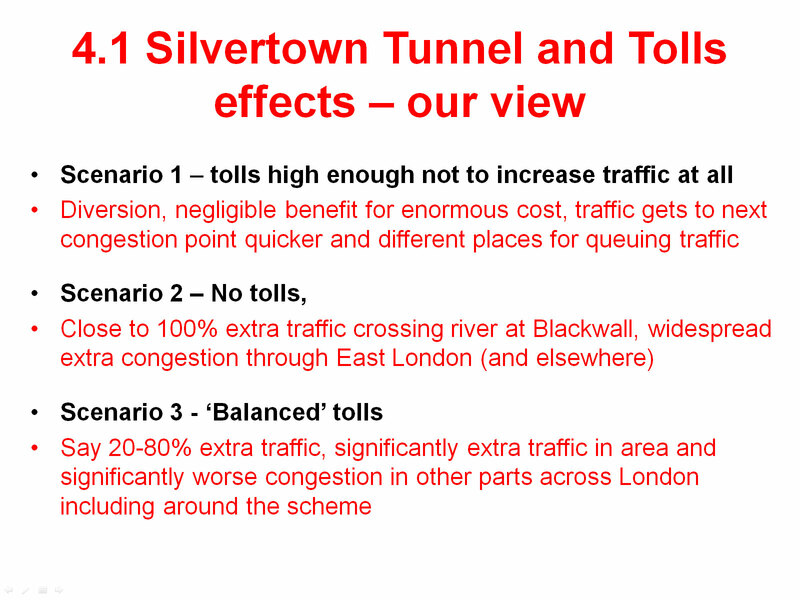 Obviously, as the No to Silvertown Tunnel campaign, we would beg you to pay close attention to what John has to tell us. Some of it is almost counter-intuitive and it’s also quite startling. Thank you. Good evening. First of all, if anybody needs to get in touch with me the [bottom of this page] has contact details, so if people have queries, do come back. The schemes and their history – their history is very very long indeed. Traffic generation from new roads – which as has been explained, I’ve done a lot of work on. But I’m not the only one to have done work on this. There is such a body of evidence that shows that new roads, especially in big urban areas, generate phenomenal volumes of traffic. The comment was made that perhaps TfL understands this better than central government, because some of the policies coming out of central government in the rest of the country are even worse. 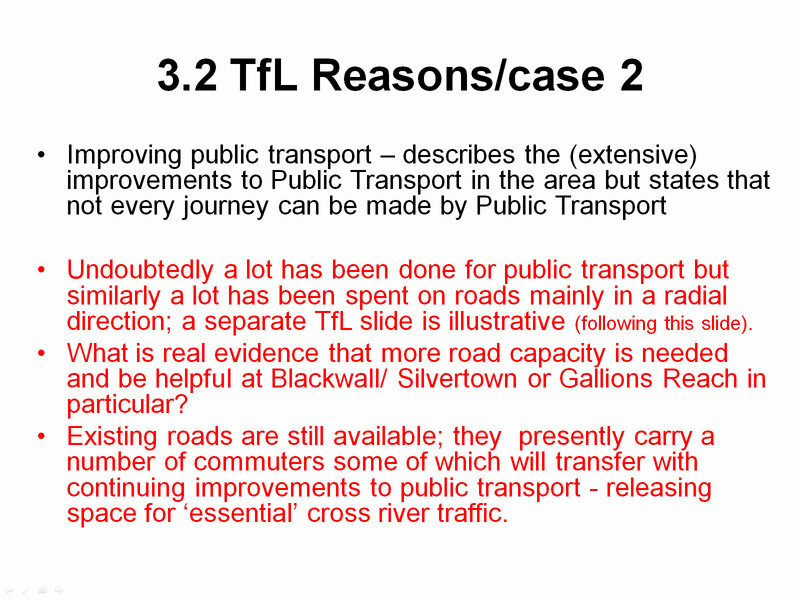 TfL case and report on consultation – I wanted to cover that, and what the traffic committee of the London Assembly said about that consultation, which was quite informative, and the results of the TfL report on the consultation which had some quite interesting things. Effects of traffic management tolls, etc. – our case, my case and TfL’s case – They’re very much the same if you sort out the words properly. Anyway, the Silvertown scheme doubles the capacity across the Thames. I don’t know what’s going to happen to that road [points to A2] because it’s full at the moment, and it’s regulated by the Blackwall Tunnel – if it has twice the capacity, it’ll have twice the volume perhaps. The Silvertown link – I’ve fought two enquiries on it, one for Ken Livingstone and one against Ken Livingstone, because he was in favour of it when it was the Thames Gateway Bridge, well it was the East London River Crossing. It could be a ferry, which I don’t think would cause a big problem with air pollution where a road certainly would. And the case was made that this scheme would extract traffic from the Blackwall Tunnel and make it work. 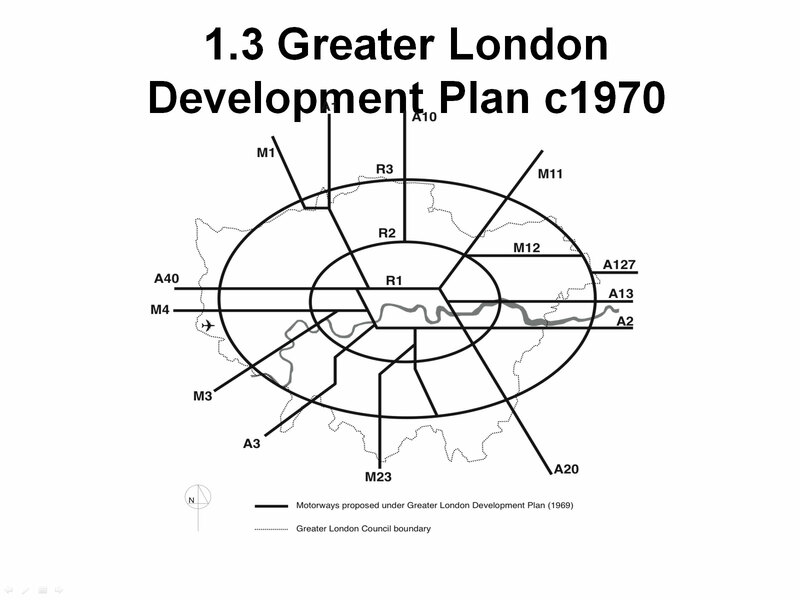 The London plan of roads in 1970: Ringway 1 included the Blackwall Tunnel and its approaches. 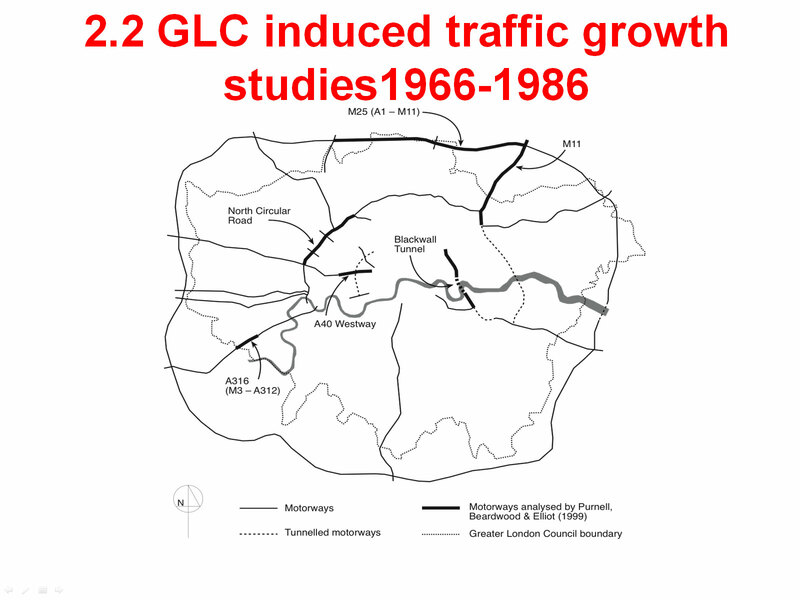 Interestingly, I was involved afterwards, and the modelled flows on that link of road in 1968 were 340,000 vehicles a day on a four-lane road in each direction. It wouldn’t fit; it just wouldn’t, it was physically impossible. And of course this other Ringway [Ringway 2], when you looked at the detail, was exactly where Gallions Reach is now. 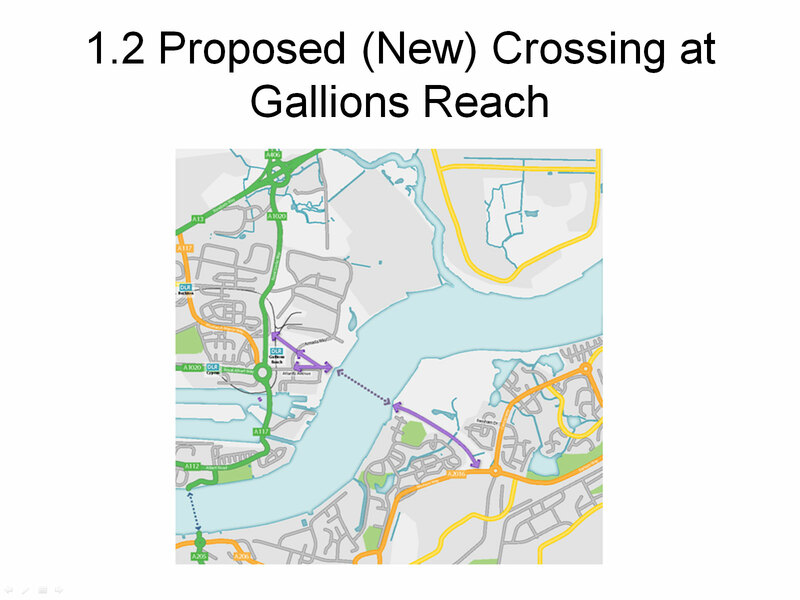 And that scheme, Gallions Reach – whether it’s renamed a bit like Sellafield – it’s been there since 1944 in various guises. When I joined the Greater London Council, I was told by the politicians there that roads generate traffic. This was a matter of policy. The government said traffic will increase regardless, and that was a matter of policy. So I tried to be professional, and civil engineers think you build a bypass, it takes traffic away from the area, so it’s good to build bypasses. So I had this difficult situation where the politicians were my masters but I wanted to keep being professional. So I found all these bits of road had been built, and the GLC had the data. That section of the M25, the M1 extension of the North Circular Road, the M3 and A316, Westway – just off the end of Marylebone Road, Blackwall Tunnel and its northern tunnel approaches, and the M11. I looked at all of those, and I had really good traffic data between 1966 and 1986 on all those schemes, and they’re sizeable schemes. So what actually happened? I’ll just take a couple of these. That’s what happened with Westway. This is the Westway corridor, not just the road. Bayswater Road was just as full five years afterwards as it was before. But for the whole corridor, the traffic levels have doubled. This is just on the fringe of central London. Two sort of controls – they’re not ideal controls – the Brompton Road corridor which was Brompton Road, Old Brompton Road, Fulham Road, and the Finchley Road corridor, which was Finchley Road, Abbey Road and St John’s Wood Road. 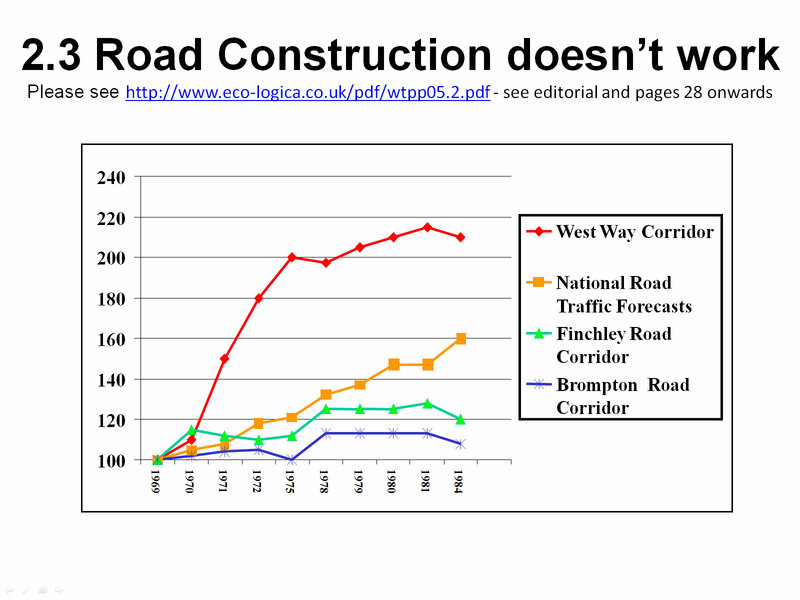 So you can see what happens in other corridors where there’s less road improvements. And you can see there’s very little change, but interestingly there was a change in this period. Both those roads – the Swiss Cottage gyratory was built, and the Earls Court one-way system was changed – so even there, there’s generated traffic but this is the nearest you can get to a control. That’s the reference to my report, which was re-published by a transport magazine, so anyone can refer to that and it’s a public document that you can get hold of. It was hushed up when the GLC closed. The Blackwall tunnel: this is peak traffic. It doubles within – this is a before and after study which I think was about six months apart. The total flow on the Blackwall tunnel doubled. Where did it come from? Nowhere, really, it’s all new. Unless there were a lot of amphibious vehicles before, it’s all new traffic. That’s peak. 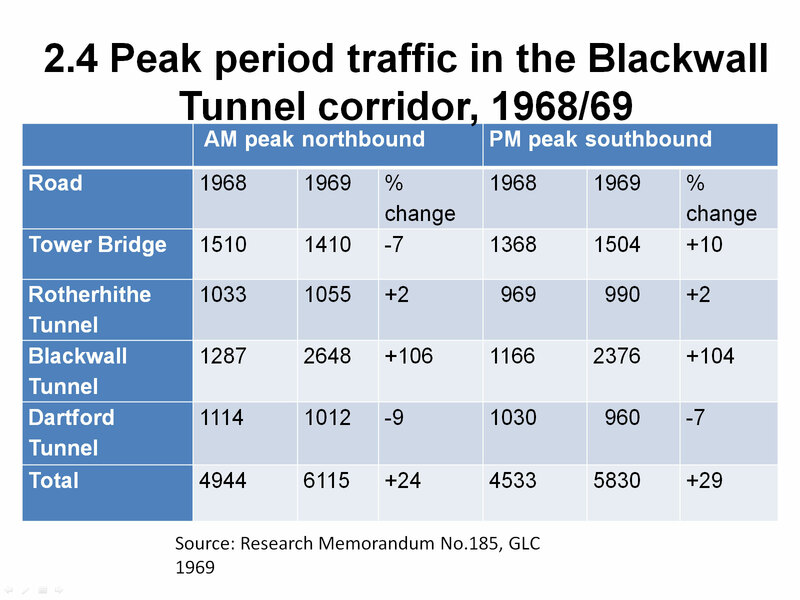 I think for the Blackwall tunnel it was about three years before the all-day traffic doubled, where it was five years for Westway, it was only about three years for Blackwall. It was really an enormous increase. ‘More river crossings will help our city grow’: the claims are all about reducing road congestion and improving reliability and opportunity to enhance environment and access for pedestrians and cyclists. I’ve very slightly paraphrased what they said but you can go back to the document, that’s roughly what they said. London has grown very substantially in the last twenty years, it has increased by about 2 million, I think. Traffic volumes, even in outer London, are now going down, while there’s been a big increase in population, so do we need more roads to cover less traffic? More and large roads increase traffic and increase congestion elsewhere – and pedestrian and cyclists! I don’t know how they used that in the consultation. The second one was ‘improving public transport’ and here they describe extensive improvements to public transport in the region, but state that not every journey can be made by public transport. Well, yeah, you can’t. And in East London a lot has been done on public transport, but also a lot has been spent on roads: the A13 has been upgraded, the route along the south bank through Thamesmead and all that’s been upgraded, Lee Highway (?) has been built. There’s a lot of road-space that’s been added, mainly in a radial direction. What’s the real evidence more capacity is needed and helpful at either Blackwall/Silvertown or Gallions Reach in particular – if it’s needed? Existing roads are still available. They presently carry a number of commuters into Central London, some of which will transfer with continued improvements to public transport, and if people transfer then there’s more space for essential traffic. That was their slide to say of network capacity across, road network capacity has only increased a little bit where public transport capacity has increase a lot. All I can say is that’s good, anyway, as far as I can see. Regular, long delays at the Blackwall tunnel, particularly during peak times – so that is where there’s no evidence that it’ll solve it. Frequent closures of the Blackwall tunnel. The need to replace the Woolwich ferry infrastructure – that was said in 1986, when the East London River Crossing came up. And the need for additional road connections to support growth – maybe it would be nice to cross the Thames more often, but do we need to cross it with a big road? And even if you separated London at the Thames, North of the Thames and South of the Thames have probably got better connectivity than anywhere else in the country. So you might want more, but do we actually need it for those stated reasons? Will additional capacity address these problems? I do not think it will. It’s more likely to exacerbate by generating additional traffic on the road network, with delays, congestion and of course pollution with more traffic in many other places across the whole of East London. Continuing public transport, cycle and pedestrian improvements that have been successful. A congestion charge at the M25 hasn’t been tried yet, but there’s an awful lot of people who do commute from outside London into London, and do they really need to come in by car? If they left their cars at the London boundary you’d get rid of quite a lot of the traffic. So park and ride at the M25 – I’m not totally in favour of park and ride as really, preferably, you should be on the rail or bus all the way, but having got to where we are, East London could be protected with a congestion charge and park and ride. More local pedestrian, cycling and transport connections throughout East London. There’s a big area, Dagenham to Erith, there’s a very long stretch of river there that hasn’t got a single crossing and none are planned. 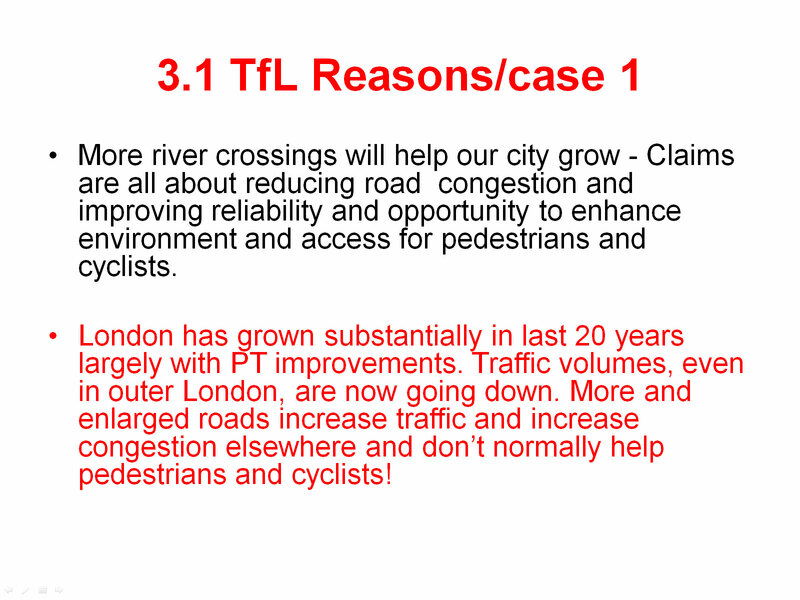 “TFL should set out clearly the objectives of its proposals for new river crossings, and their different impacts” It’s quite telling that this is obviously a group that still believe – or most of them believe – that road improvements could help. “It would be important therefore for TfL to define the purpose and differential benefits of both proposals under consideration, including a wider range of options beyond the principal proposals of these two road schemes” So: no other proposals. That was under principle 1, the first bullet point. Principle 2: TfL’s consultation process must be transparent. 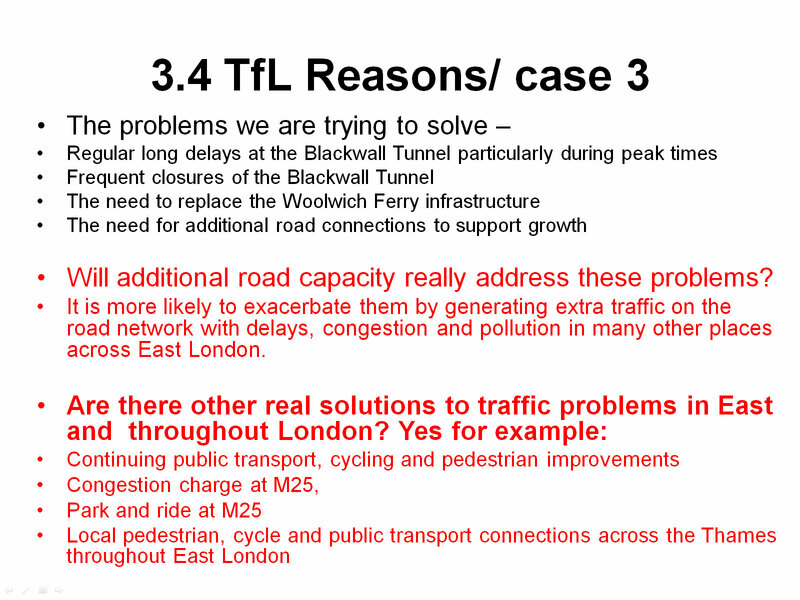 “The information used to underpin the Mayor’s and TfL’s proposal [?] should be available for the duration of the consultation process. 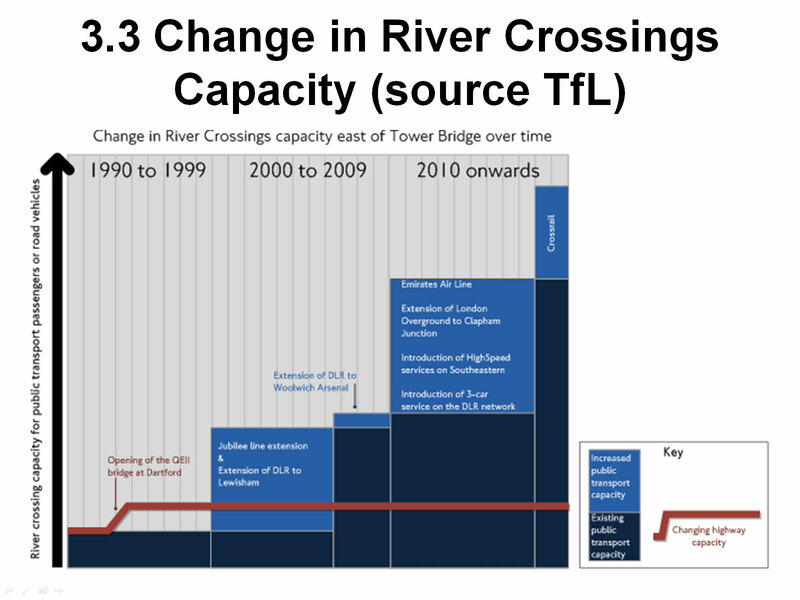 The more information TfL provides on the impacts of the crossing, the more legitimate it will make the consultation process. TfL should learn from the successes and failures of other schemes,” and they said that the inspector’s report from Thames Gateway Bridge, where the inspector was very doubtful about the economic regeneration with Thames Gateway Bridge, and he also commented about the second Blackwall Tunnel doubling the flows. 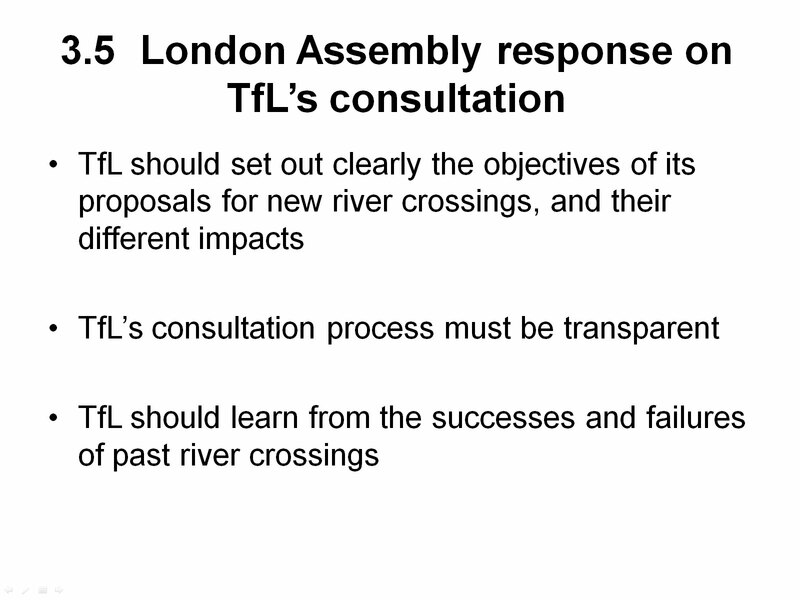 “the comments we received highlighted these are issues TfL needs to address in the ongoing river crossings programme” – shame it wasn’t addressd before the consultation. 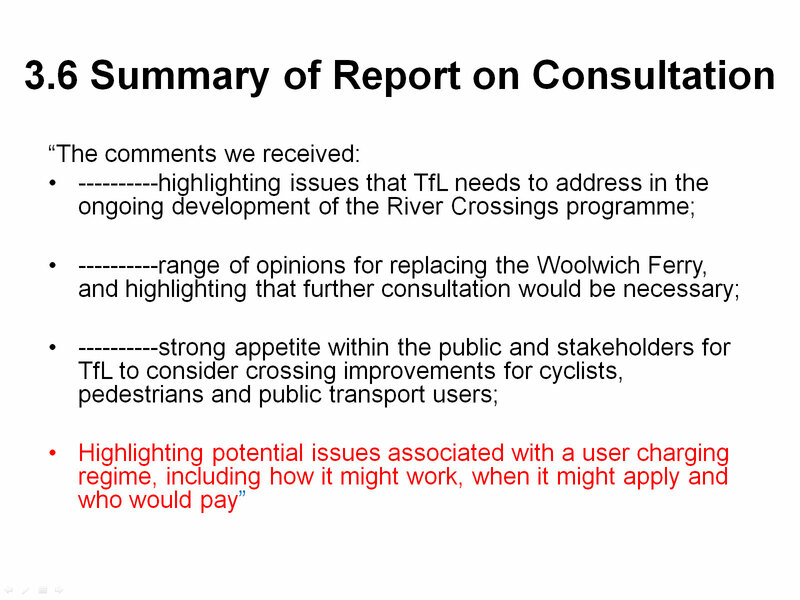 “The range of opinions for replacing the Woolwich Ferry highlighted that further consultation would be necessary” – there were a lot of opinions there. “Strong appetite within the public and stakeholders for TfL to consider crossings for cyclists, pedestrians and public transport users” that were not included in the proposals. “Highlighting potential issues associated with a user charging regime, including how it might work, when it might apply and who would pay.” It seemed there were an awful lot of people who were strongly against the charging regime. And the scheme will not work, and is not worth engaging in at all without some sort of charging regime, I don’t believe. Scenario 1: Tolls high enough not to increase traffic at all. That would mean diversion of the existing traffic to the existing crossings, negligible benefit – because you wouldn’t get any more traffic through than you’ve got at the moment – for enormous cost, but still traffic gets to the next congestion point quicker, and there are different places for queuing traffic. Now there’ll always be queueing traffic, there’s always an insatiable demand […] There’s the same amount of traffic around, it’ll queue somewhere else if it doesn’t queue at Blackwall. Scenario 2: No tolls. And the evidence is that you’ll get 100% – or thereabouts – more traffic. Because you’ve got 100% extra capacity. So, what did TfL say about it in the Report on the Consultation? 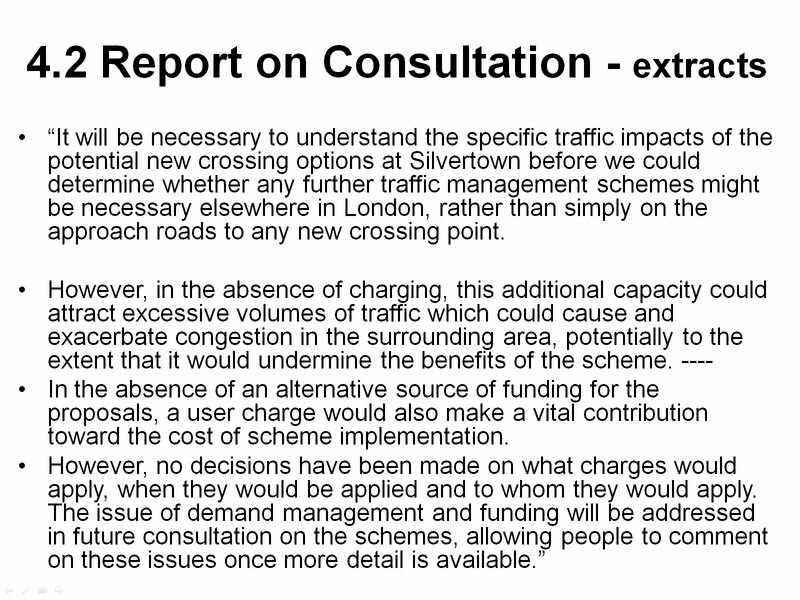 They go further than just the tolls: “it will be necessary to understand the specific traffic impacts of the potential new crossing options at Silvertown before we could determine whether any further traffic management schemes might be necessary elsewhere in London rather than simply on the approach roads to any new crossing point” It’d never work. “However in the absence of charging, this additional capacity could attract excessive volumes of traffic” – same thing as I’ve just said. The funding I haven’t mentioned – obviously – they’ve got to fund it, and funding is an important reason for the tolls. But then there’s “no decision to be made”, but without some decision, without some ideas about how it’d work, the scheme in my book is dead in the water, and they shouldn’t be consulting on something that can’t go ahead. So that’s what I hope I’ve covered, and obviously I’ll be open to questions. Thank you. 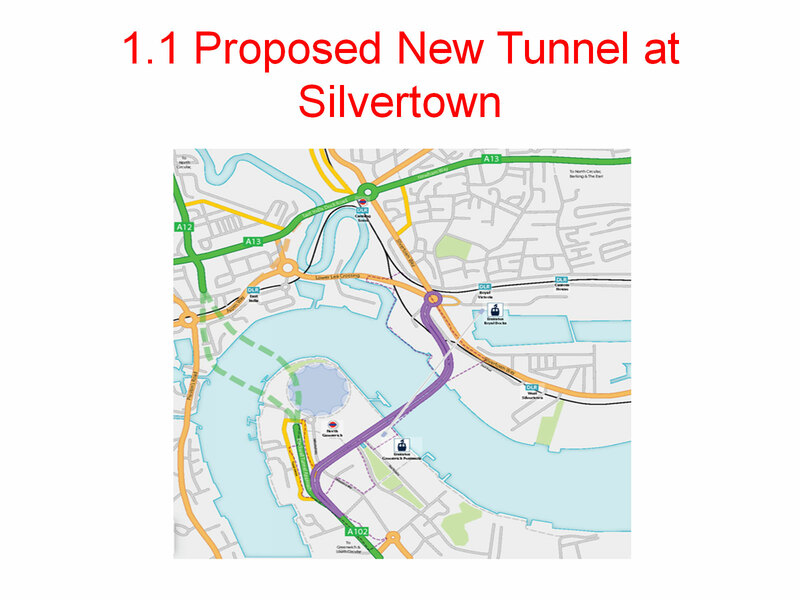 “No to Silvertown Tunnel” would like to thank John Elliott for taking the time to come to Greenwich and discuss issues of transport planning and induced traffic with us. Subsequent posts will feature the remainder of the meeting and presentations from Sian Berry and Andrew Wood, along with the public Q&A session. This entry was posted in News and tagged air pollution, air quality, chris taylor, congestion, gallions, induced traffic, john elliott, river crossings, silvertown tunnel on November 9, 2013 by Nikki Coates.